From the producers of the Social Media Boot Camp for Hawaii’s human resources, recruiting and staffing professionals, SHRM Hawaii and Social Media Club of Hawaii are proud to present a full-day seminar on how to find and recruit top talent. Hawaii employers & staffing agencies have benefited from Shally’s expertise when he’s presented at past Social Media Boot Camp events co-sponsored by SHRM Hawaii and the Social Media Club of Hawaii. Local recruiting and staffing professionals have had incredible success using his proven sourcing methods on social channels. We are excited to bring Shally’s advanced training workshop to Honolulu. How to get in front of the 2% unemployment and discover and engage top talent for your organization. How to find the kama’aina, but also how to most effectively engage with them, and sell them on your opportunities back home. How to leverage technology to recruit better, smarter, and more economically. From social media to the deep, deep web, Shally will maximize your efforts to identify and recruit top talent. In addition to Recruiters and HR Experts, this seminar will benefit executives and owners who want to understand the new way to recruit. 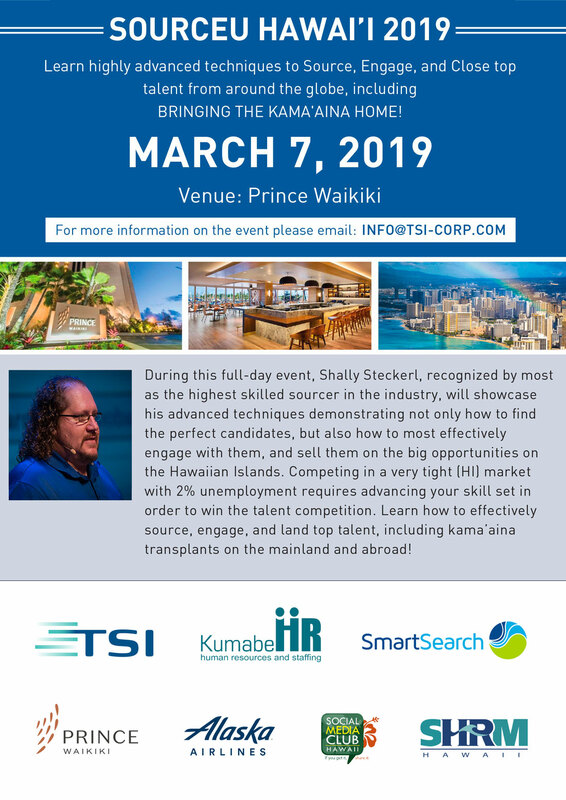 Prince Hotels Hawaii is providing a world-class venue where you will have the chance to participate in discussions and get your questions answered by the founding father of sourcing and a recruiting industry pioneer. Seating is limited…so act now and reserve your seat! All proceeds (minus expenses) for this event will go towards scholarships for the University of Hawaii Shidler College of Business Masters in Human Resource Management, and The Sourcing Institute Foundation, a 501(c)(3) non-profit, that provides educational grants to veterans, active military spouses, and disabled individuals who would benefit from employment in the sourcing and recruiting industry. Social Media Outreach: So you found them, now what? You’re the world’s greatest sourcer but that means nothing when you can’t get them to respond. Combining these social media and mobile outreach tricks with some psychological “people hacks” will deliver you from InMail hell. Learn how to weave your cold calls, voicemails, and emails with new social media outreach strategies that increase your call-back ratio by at least 20%. Know how to prioritize various communication vehicles to get faster responses from prospects. Find the social footprint for many of your candidate prospects so you can expand the way in which you connect with them. Know what to include in your social media messages that will increase the likelihood of generating a positive response. Learn the values of having your own Facebook page and LinkedIn group and which types of activities are best for each of the social networks. Persuasive Communication Styles: How to quickly build rapport by phone or in person through the four primary and secondary styles to instantly build rapport with whomever you speak with by phone or in person. Natural Language Search: Take a deep dive with one of the most innovative minds in the industry and explore how to stay ahead of the sourcing curve. Imagine using universal search techniques that work in any database. Uncover talent hidden in plain sight by searching for language patterns, finding people in associations and conferences, and other web-based content not easily accessible through mainstream search engines. You’ll never be a world-class CyberSleuth unless you learn the easy magic of Natural Language Search. Forget complex Boolean logic and advanced syntax, these search hacks work in any database, and will have you finding people you have right under your nose and never even knew existed in your own ATS, on resume databases, and even people you never knew you were missing on LinkedIn. Peer Regression Search: Learn to use competitive intelligence search techniques to find the candidates that others won’t. Find your target prospects using image captions, video transcriptions, and comments hidden from search engines. Gather information through searches for user names and aliases on public websites. Identify key individuals like thought leaders or famous, popular, prominent, or otherwise notable people in your target field or industry. Reveal others they work(ed) with, influenced, or were influenced by to identify hidden talent. Deep Web Search: Apply creative search string theories that uncover crucial sourcing data lying deep in the Web that standard methods never find, including associations, conferences, user groups, discussion lists/listservs, mailing list archives, and more. Learn how to mine documents that can lead you to finding passive talent not otherwise searchable.